so long ago. recall patrick was low key,but did a super job espcially with the new album. 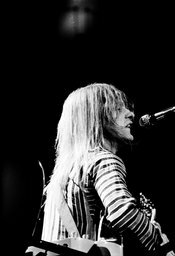 The departure of Rick Wakeman from the British rock quintet yes was not really like Barnum's leaving Bailey, but it must have given the group problems. Mr. Wakeman played keyboards, surrounding himself with electronics and synthesizers, and was really the focal point. Therefore much attention was focused on his replacement, Patrick Moraz, when yes appeared at Madison Squire Garden on Wednesday. 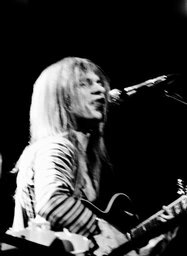 Actually, there was little difference in approach - Yes played a more tightly structured form of Euro-rock than most, with many tempo changes and scenic delights (dry ice smogging up the stage and so on). Mr. Moraz fitted into all this with the expertise of a computer programmer, able to provide all manner of exotic and detonative backgrounds. Much of the program was new, but the music remained basically unchanged and on the long side. "The Gates of Delirium," a new piece, lasted more than 20 minutes, entering the Vale of Tedium before its close. A packed arena remained entranced by it all. 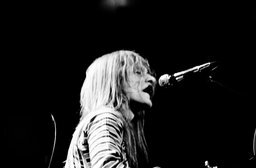 Gryphon, a new British group, suffered from audience turmoil as the opening act, but sounded as if it can stand up to its strong reputation in better circumstances. 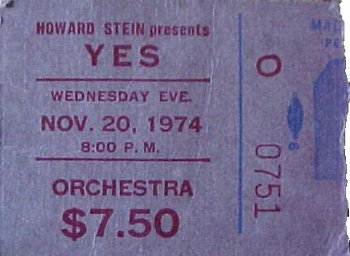 My first Yes concert!! 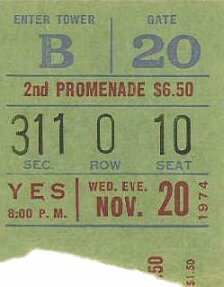 !We had seen Rick Wakeman solo at the Garden the month before and were wondering how the new Yes would sound.We were all blown away!! !As a thirteen year old kid I was amazed at the size of the stage and still say this was one of the loudest concerts I have ever heard.I can still feel the excitement of the lights going down during Firebird Suite.Yes strolled out through a snakelike tube!First song ,a new one,Sound Chaser!! !Then the disco ball lights looked like a flock of birds swirling around the Garden as the opening sounds of Close to The Edge freaked us all out.We had seats behind the stage and me and my buddy Dave wanted to check out the front so we walked around and sat in the aisle for And You And I,before getting chased out! !A great night !! !We even went out and bought the Gryphon albums.I left the Garden with a program,a Relayer poster and a T-shirt.A week later my older brother used the shirt to clean his car engine! !But the memories of that night are among my all time favorites!! 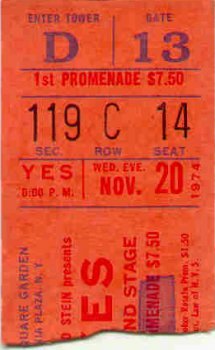 Yes played 'Siberian Khatru' as a first encore at Madison Square Garden in November of 1974 during the Relayer tour. Squire's base dropped out of the mix about midway through and the song sounded terrible. It came back for the instrumental ending. Thank you very much. I say, it�s fantastic back in New York, quite soon. We'd like to carry on with a song from our new album, as was the first song we played to you, that was called 'Soundchaser'. And the next one we're going to play, the new music, is a thing called 'To Be Over'. I hope you like it. We'd like to carry on with another new song. This is from..um the new album. The title of the new album is 'Relayer', and..uh should be out in about ten days time, before Christmas anyway and..uh the title of side one is 'The Gates Of Delirium'. I hope you like it. Thank you very much, thank you. I hope you like the new music. We're going play a couple of..uh things. One is from the 'Close From The Edge' album. 'And You And I'. Thank you. Thank you. Thank you very much. I'd like to thank you all very much for coming along. We're going to finish up with a song from 'Topographic Oceans' now. Let�s give you side four, 'Ritual'. Thank you very much. We�ll see you, are you going to dance? Thank you. Now this time, we want to see you dancing and sing along with us. I'm sure you know this one.